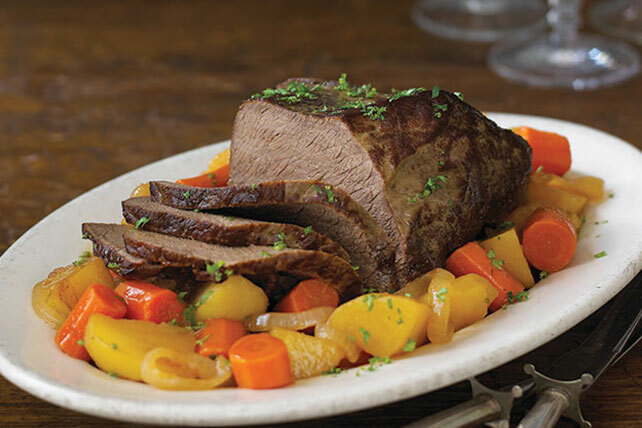 Any Midwesterner would agree that our juicy, veggie-ful pot roast is a prairie-worthy dish. Simple prep makes this low-cal meal an instant classic. Season meat with salt and pepper; cook in 1/4 cup dressing in Dutch oven on high heat 6 to 8 min. or until browned on both sides. Add onions; cook 5 to 6 min. or until caramelized, stirring occasionally. Add remaining dressing, potatoes, carrots and enough water to come 3/4 the way up side of meat. Bring to boil; cover. Simmer on low heat 2 hours or until meat and vegetables are tender. Remove meat from pan; cut across the grain into thin slices. Serve meat and vegetables topped with pan drippings and parsley. If a thicker pan gravy is desired, mix 1/4 cup water with 2 to 3 Tbsp. flour. Transfer meat and vegetables from pan to platter; cover to keep warm. Bring reserved liquid in pan to boil on medium-high heat. Gradually whisk in flour mixture; cook and stir until thickened to desired consistency. Prepare using a 2-lb. beef rump roast and increasing the final cooking time to 2 to 2-1/2 hours or until meat is tender. Prepare using any other all-purpose potato. If only baking potatoes are available, add them to cooking liquid for the last hour of the cooking time.